Looking at ceiling, up Tower A of the VAB. Note that the tower goes all the way up, but that an area is open between Tower A (left) and Tower B (lower portion of photograph). This is obviously not a great picture. How the VAB is constructed. The Vehicle Assembly Buiding at Kennedy Space Center, Florida, is the largest building, in terms of volume, in the world. The VAB was constructed in the mid-1960s to assemble the rockets and capsule in the Apollo program. The Apollo program landed men on the Moon six times between 1969 and 1972. It also served in the Skylab program and for the past 30 years has been the place where the shuttles have been mated with their rockets prior to being taken, as a single unit, to the launching pads. The VAB, at 500 feet, is an iconic building of the American space program and is visible for miles. It is adjacent and mere steps from the Launch Control Center and its four firing rooms where the Apollo, Skylab and Shuttles have been launched. The VAB is also directly across the street from the Complex 39 Media Site where all media coverage of the launches of the shuttle originates. The VAB is adjacent to the three Orbiter Processing Facilities (OPF), the shuttle hangars. To the northwest of the VAB, several miles away, is the Shuttle Landing Facility (SLF), the runway where shuttles land in Florida. Shuttles also land in California and New Mexico when weather conditions do not permit a Florida landing. The VAB is constructed of six supporting towers designated A, B, C, D, E and F. Three of these towers each inter-connect up to the 16th floor on opposite sides of the main open bay. The bays between the towers are open above the 16th floor. 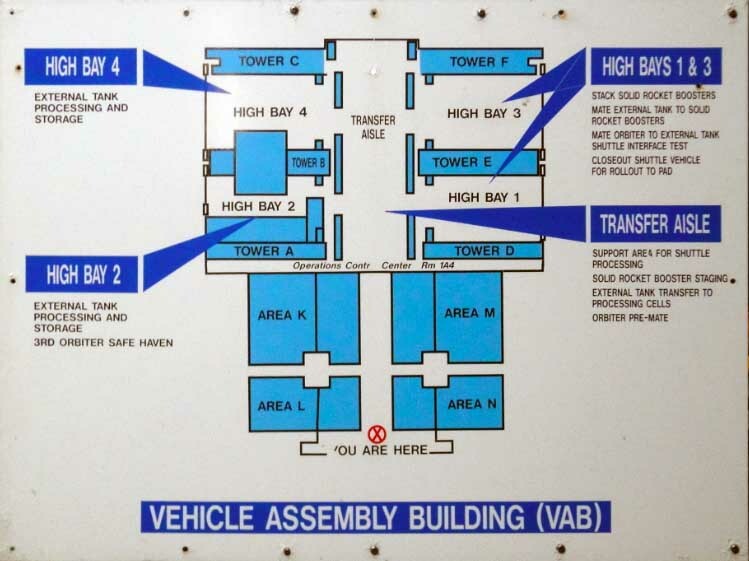 The shuttle bays themselves are in between the D and E, and the E and F towers. 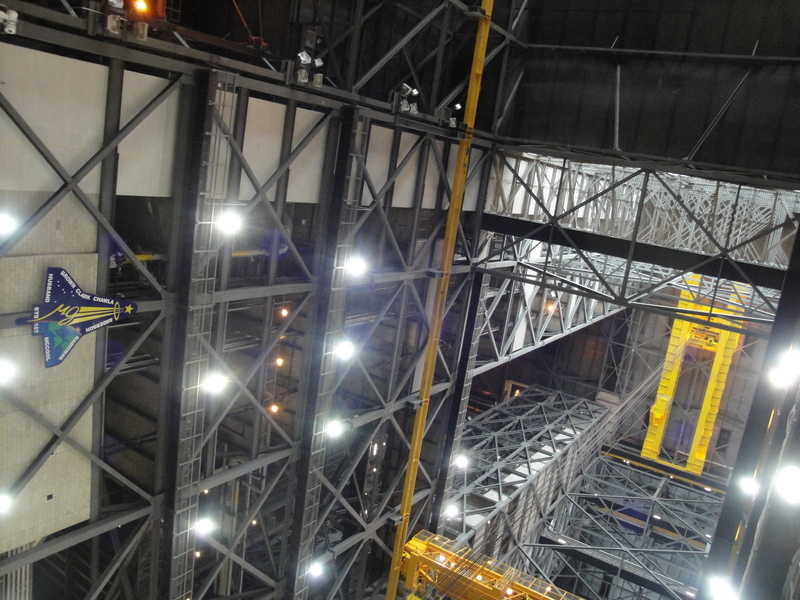 Therefore, to place a shuttle in one of the shuttle bays, a shuttle must first be lifted from the main central bay, above the 16th floor, and then moved laterally into the shuttle bay, before being lowered and secured to the five-story high Crawler which will carry the shuttle to the launching pad. Floor plan of the Vehicle Assembly Building. On May 18, 2011, the shuttle Atlantis was moved from the Transfer Aisle into High Bay 1 between Towers D and E.